Continuation from the previous post Kurudumale. About 4 km from Mulbaghal town lies a beautiful temple dedicated to Lord Shiva, Virupakeswara. As per the priest, small Linga in the temple would change the colour thrice a day. Lingam colour will be Red in the morning, honey colour in the afternoon and black in the night. The other deities of this temple are Lord Venugopalaswamy, Goddess Durgaambaal who is gracing the devotees in the sitting posture with leg on either side of the Lion. Around 8 km from Virupaakshi temple lies the beautiful Ramalingeswara temple. It is said that Lord Rama engaged in war with his twin sons Lava and Kusha. It is a great sin to start war with the lads, Lord Rama approched sage Valmiki for cleansing his sin. Valmiki suggest to install Lingam to get out of the sin. After Rama installed Lakshmana, Bharata and Satrugana also followed. This temple was built during Chola dynasty. The Lava Kusha hills with Seetha matha temple on the top as a backdrop add beauty to this Temple. The Ashtadikpalas, Rulers of Eight Directions - Click here for more details. Locals believe that Lava and Kusha were born in here. Hence the name Lava Kusha Betta (hill). 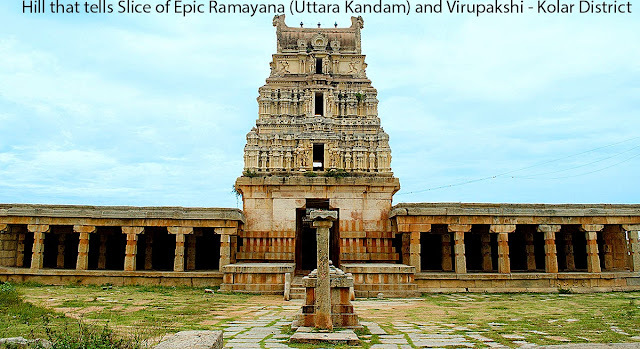 One has to climb up the hill to experience Uttara Kandam Ramayana. The trekking to the hill takes us to the beauty of the surrounding rocks. It seems to us that the rock has been beautifully arranged in some order by the people. It is said that after the washerman doubts Sita's chastity, Rama sends her to the Valmiki Ashram. The local say that Valmiki stayed here, was looking after Sita and Lava and Kusha were born in this hermitage. People also believe that Sita was weeping after overlooking the war between Lord Rama and his sons Lava, Kusha. Even today one could find where Sita had washed her clothes. It took nearly an hour to climb up and down the hill. When we reached Sita Matha temple it was closed, later we came to know that one can approach nearby Ramalingeswara priest to open the temple. Near to Ramalingeswara temple lies Sarada Devi Temple. Opposite to this temple is the Sringeri Jagadguru Shankaracharya Sharada Peetham. As we were already late, we did not visit the temple and returned to Bengaluru.